Happy New Year’s Eve my friend! New Year’s Eve is one of my favorite holidays, probably because it falls at the end of my favorite week of the year—the week between Christmas and New Year. Life slows down just enough during this week that I can spend some time reflecting on the past year and planning the year ahead. There’s so much to be learned from and to be grateful for in the past, and so much hope and promise in a brand new year. This makes for a pretty magical week. 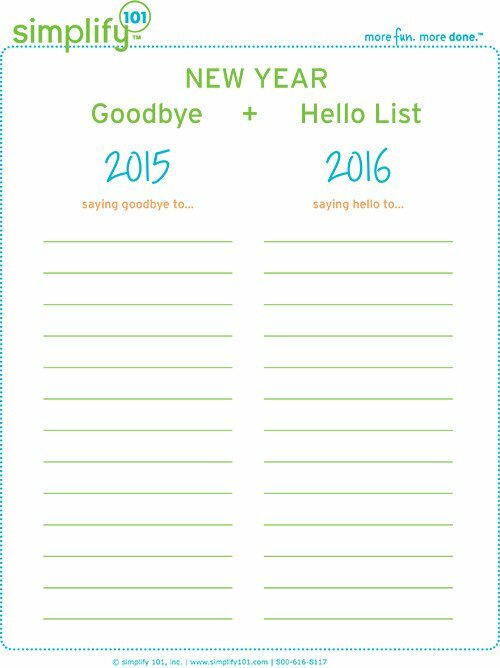 A few years ago I put together a Goodbye + Hello printable for New Year’s Eve. It’s a fun way to intentionally decide what you’d like to say goodbye to, or leave in the old year, and what you’d like to welcome into your life in the New Year. You can download your own copy below. Goodbye injury and illness. Hello healing and health. For the Garveys, 2015 had its share of bumps in the health department. There was Jay’s big medical event last fall. For me it was a foot injury that has prevented me from running since May. We’re incredibly grateful for Jay’s recovery and the perspective it has given both of us about what really matters to us. But we are more than happy to say goodbye to that chapter of our life, and leave it all in 2015. Hello continued healing for Jay and my foot, and hello to a healthy 2016 for all of us! I am determined to run again in 2016 one way or another! This is my top goal for 2016. I can’t wait to cross the finish line of my next half marathon…running! I’m sure there will be tears of joy streaming down my face and I can’t wait! Goodbye stale and outdated. Hello fresh and new. Goodbye chips and crackers. Hello cucumbers and carrots. I have a confession to make: I eat too many chips and crackers. Between this habit and less running, it’s starting to show! It’s time to up my healthy eating game one more notch and snack on healthier foods like cucumbers and carrots. Hello yumminess! Somehow in 2015 my gratitude habit fell by the wayside. It’s time to say hello to gratitude again. Goodbye staying at home. Hello road trips. It’s hard to believe, but it’s time to start visiting colleges. And let’s throw in another trip or two…just for fun. It’s so easy these days to compare ourselves to others. Social media floods us with images of homes and lives that seem perfect, which can make it easy to feel as if you’re coming up short. (Okay, maybe it’s just me?) I’d like to say goodbye to comparison, and say hello to embracing myself and my life exactly as it is. Hello authenticity. I think we’re going to be fast friends. If I’m being honest, I’m not really a huge complainer. But sometimes I indulge myself in the complaining. So this one is a reminder to leave complaining in 2015…and make 2016 the year of focusing on solutions. I have wanted to improve my photography skills for years (and years, and years.) 2016 feels like the right time to do it! Finally, in 2016 I’d like to take this blog in a slightly new direction. Sure, I’ll still blog about organizing from time to time. Organization oozes through me like blood, so I won’t be able to help myself. But…I also enjoy other things and like writing about other topics, too. I’m excited to share and explore other topics that inspire me, and hope you’ll be inspired by the new direction, too. I think my list is a wrap! What are you leaving in 2015, and saying hello to in 2016? p.s. Do you want to say goodbye to clutter in 2016? If so, be sure to check out our store-wide sale on all of our self-paced online classes! The prices are crazy good, so be sure to stock up! I just wanted to let you know how much I appreciated this post and your list of goodbyes and hellos helped gave me some ideas as well. I love the printable and cannot wait to do it this evening as part of my New Year tradition. Thank you. Thank you Miste! So happy to hear you enjoyed the post and printable. Happy New Year!! I, too, am going to make this a new tradition. Our 15-year-old daughter, Brianna, earned her wings and went to heaven January 13th, 2015, so we need a new tradition. It is so hard to think about beginning a new year without her in it. So, I will make this my activity for after dinner tonight and set some new goals. Thank you for always being inspiring and positive! I love Simplify 101!